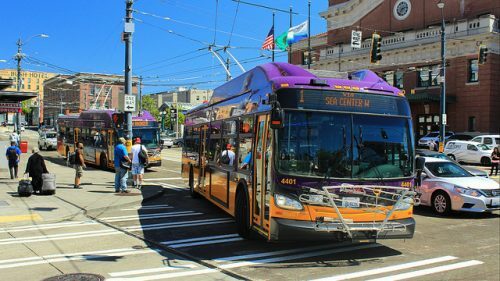 On Monday, the King County Council unanimously voted to separate Metro from the Department of Transportation and make the agency an autonomous, cabinet-level department. In the same meeting, the council unanimously voted to keep Rob Gannon as the director of the agency; as an autonomous department, the Metro director is now a political appointee, rather than a civil service position. Since its inception, Metro has long been a part of King County’s Department of Transportation. KCDOT administers Boeing Field, the West Seattle Water Taxi, county roads, and the county’s vehicle fleet. Metro has run more or less autonomously for years, but was still supervised by the KCDOT director. Balducci ran the county’s jails from 2010-14. She said that, while she held that position, Metro’s head always sat in on cabinet meetings with the King County executive. That arrangement created awkward conflicts of interest, since the director of KCDOT—the Metro director’s boss—was also in on the meetings. The change to the county organizational chart aside, but Balducci said that Metro’s coming spate of capital projects is one reason for the change. That capital investment includes large-scale RapidRide expansion. Metro is also in the early stages of siting and acquiring new bus base facilities. Gannon’s leadership of Metro has earned acclaim, so his promotion was an easy decision for the council. Balducci praised Gannon’s leadership restructuring service through service changes. She also cited his work coordinating Metro service with other agencies, including Sound Transit. Balducci also appreciates his leadership style. She agrees it’s a sharp contrast to Sound Transit CEO Peter Rogoff’s more aggressive methods. Officials including Jenny Durkan and Rob Johnson say Rogoff created a hostile workplace, something he and the agency are working to correct. Metro has not been part of KC DOT since its inception. Metro used to be a separate agency handling transit and water treatment. Affirm…when I went to work for Metro in 1991 it was the “Municipality of Metropolitan Seattle”, a separate government entity, a creature of the state. Metro merged into King County in 1994 as a result of a decision by Federal Judge William Dwyer in regards to a lawsuit. The judge didn’t merge the bodies, the voters did. Metro (then the Municipality of Metropolitan Seattle) merged into King County as a result of a public vote in Nov 1992, after the same vote failed in Nov 1991. But as you mention, the matter was brought to the voters after Judge Dwyer ruled that Metro’s governing structure was unconstitutional. With King County’s suburbs rapidly developing at that time, there was also an issue of land use & transit decisions being made by two different bodies. The idea to merge Metro into the overall county government was thought to be a remedy to both problems: Metro’s governance & making decisions about development & transit together (in theory). The voters said no in ‘91 but yes in ‘92. For a time initially Metro was the KC Metropolitan Services Department while transit & the other part of the earlier Metro (water pollution control) were sorted out. Then the water treatment part went to KC department of natural resources, & transit went under DOT, where it’s been until today’s official decision. Does this development reverse the merger? No. It’s still a county department. Obviously, it doesn’t, because Metro is still an agency of King County. My real question is not only what all has changed in the last 22 years, but more important, what do these changes put at the top of Rob Gannon’s work schedule this morning? I’m curious about one thing not touched on in the OP’s piece. With this organizational change, what will be the overall impact on FTE’s, i.e. what net increase/decrease is anticipated? Becoming their own department means they will get their own budget. Do we know what that will be? Metro already had its own budget because it has dedicated revenue sources applicable only to transit. Still, the county council has had to approve Metro’s budget and that will remain the case. Next year’s Metro budget will be approved along with the rest of the county’s budget around Thanksgiving week. I haven’t lived in King County for awhile. Can I get a rundown on each Councilmember’s view of transit in general, and what their priorities are? If you had to pick a working leader for the council itself…who would it be? The fact that ST Boardmember and County Councilmember Claudia Balducci expressed an opinion on someone’s management style puts this on topic: Of all the officials overseeing Sound Transit, whose own signature will terminate a Sound Transit CEO? Because, including but not only the King County Council and the Sound Transit Board, a hire is generally a group effort. Same with decision to send someone to therapy rather than out the door. Person or his conduct- not the point. But a major test of mine for the way someone will handle their office. Whose handwriting will keep someone or fire them? Its members individually and as a body- anybody’s thoughts on the King County Council? And now the work starts to stop/prevent privatization from growing and keep the union workforce employed. Robert, for every claim that cheap means same as efficient and economical, good first counter-move is to adopt the balance sheet for a battle flag. Usual lie is that any red ink means waste. Instead of an indicator of healthy ratio between expense and return. No banker considers a machine shop owner a good credit risk if he brings in a truckload of ruined machinery for collateral, as proof of cost consciousness. Same as with the historic truth about The Boston Tea Party- a protest against a single tax, not a revolt against Government spending. Reason I keep stressing importance of actual Republicans (as opposed to old-fashioned pro-slavery Democrats) is that they’ve mastered the boring subjects like history and accounting that can take down Fake Financial Responsibility with one squeak of the chalk. Wide open way to keep a union workforce employed. Increase its membership, thereby putting more working people in the tax brackets we need to get our civilization at least back in the fourth world. Motivated by conditions that don’t leave crews in worse physical shape than our roads and dams are now. And trained so wasted operating costs don’t throw both black column and red off their rocker-arm bearings. Correct ink color for expense budgeted and wasted is “Feedlot Floor Brown”. By law, must be natural, organic, and fresh. Next sewage plant we lose, tide off Magnolia could be coming in instead of going out. So is this going to make metro more like CT? If so, does this mean more inter county service? No, It doesn’t make it more like CT. Metro is a department of King County. Community Transit is a separate Transit Benefit District, like Pierce Transit. The governing structure has nothing to do with inter-county service. The primary responsibility for inter-county transit now lies with Sound Transit, because each agency must focus on what benefits its own taxpayers. In Community Transit’s case, a large chunk of that is getting to King County where most of the jobs are. In King County’s case, most of the jobs and destinations are already in King County, and getting to other counties is a low priority.